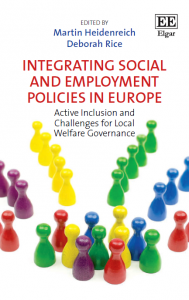 New volume on “Integrating Social and Employment Policies in Europe” published! An edited volume based on the research findings of LOCALISE has just been published with Edward Elgar! edited by Martin Heidenreich and Deborah Rice, Carl von Ossietzky University of Oldenburg, Germany. Summary: A central goal of European activation policies is to integrate social and employment policies into a coherent active inclusion approach that fosters social cohesion and enhances the employment chances of vulnerable groups. This requires a reorganization of social and employment services especially at the local level. On the basis of empirical studies of six European welfare states, this book explores how different institutional contexts influence localized service delivery and how local actors deal with the associated coordination challenges. This article was published on 2nd July 2015 by Deborah Rice.